Looming mountains, far out villages, youthful Indus River flowing on one side, high altitude barren lands and miles of silence, it seems like Ladakh has stood still for centuries. This is the place where sun plays hide and seek with clouds hovered around the peaks of monastery and magnificent Rocky Mountains and chilly winds blow so strong that the Tibetan temple keeps on fluttering. One can be easily taken aback by the sheer magnitude of the spiritualism all around. 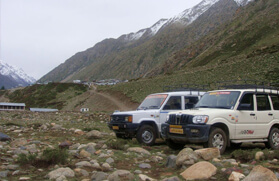 Further discussing about the ten days jeep safari expedition, it commences from Delhi. 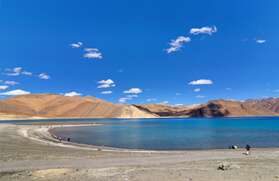 Then, a two-hour flight from Delhi will take you to Leh. 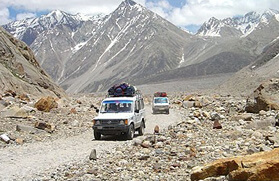 Thereupon you will board on an exhilarating drive via Khardung La, one of the highest motorable roads in the world, to visit Nubra Valley. A green oasis amid stark slopes and harsh arid mountains, Nubra Valley can be best enjoyed by a ride on double hump Bactrian Camel. Following that, you will pass a series of a high mountain passes to reach Diskit, a village in Leh and a famous tourist attraction. Next day, after exploring the Diskit monastery, you will go for a sightseeing tour to Likir Gompa, Alchi Gompa, and Lamayuru Monastery. Further, you will be visiting Kargil, the exciting region of Jammu and Kashmir has witnessed many bloodshed and wars. 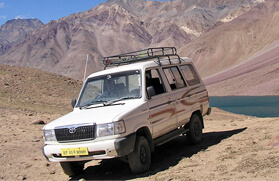 And then you will visit Srinagar and further Leh, where you jeep expedition trip will end. 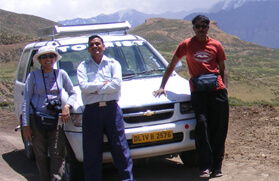 Apart from Ladakh, through this tour one can also go for a sightseeing tour to Delhi. 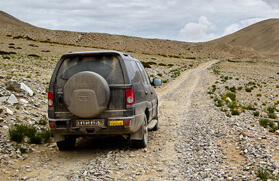 For more details about this jeep safari, go through the itinerary mentioned below. See below for complete itinerary. Board an early morning flight to Leh. Upon arrival, you will be transferred to a hotel. The evening will be free for leisure. Dinner and overnight stay at Leh hotel. Today, early morning, you will be visiting Thiksey and Hemis monasteries. In the first half of the day, you will be visiting the Thiksey monastery to be a part of the 'praying ceremony.' Further, you will visit the Hemis Monastery, a Tibetan Buddhist monastery (Gompa) of the Drukpa Lineage. While coming back to Leh, from Hemis, you will also be visiting Shey Palace. Dinner and overnight stay at Leh. Dig up in an early morning healthy breakfast as today is going to be a little chaotic and exciting. 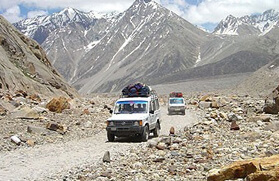 Drive up the hill to Nubra Valley, which is only accessible by Khardung La (5,570 Mts. 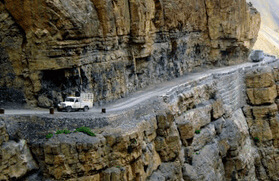 ), the highest motor able road in the world. 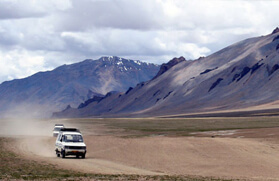 Driving across the Khardungla takes us to the heart of the Nubra Valley, Hundar, near to the Diskit monastery. Also, you will see one of its kind, Bactrian Camels (Shaggy double hump Camel), roaming in and around the valley. 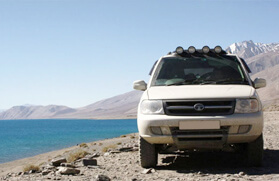 After spending some time in the Nubra Valley, you will visit the White Sand Dunes at Hunder. Few kilometers from Hunder is Diskit, which will be your next site for overnight stay and dinner. 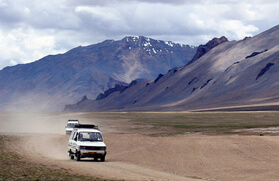 From Diskit, make your way to Leh by crossing sand dunes. 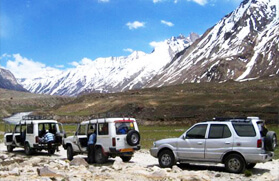 Take a ride to some of the ancient passes and have a glimpse of village life in Nubra Valley through a Camel Safari. Dinner and overnight stay at Leh. After breakfast, take a Leh-Srinagar road to reach Likir Gompa. Spend some time at Likir and then drive for some extra kilometers to reach Alchi Gompa, a monastery that houses unique paintings of 11th century. Later drive to Uleytokpo for overnight stay and dinner. Drive to Kargil and on the way visit Lamayuru monastery which is the unique and oldest monastery in Ladakh. The drive moves over Namik-La (3,697 Mts. ), and we reach Mulbekh where there is a Chamba statue carved out of a single rock approximately 50 ft high, over Fotu-la (4,087 Mts.) which is the highest pass on Leh - Srinagar road. 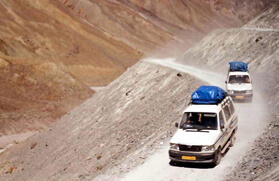 After viewing fascinating view of granite color soil rocks, drive down through kangaroo curves to Kargil. Overnight at hotel in Kargil. Proceed to Srinagar via Drass (Second Coldest inhabited a place in World), visit Kargil war museum, Minimarg and cross Zojila (3033 Mts.) pass to reach a beautiful destination of Sonamarg in Kashmir Valley. After passing the Jimmy Gate on Zojila we enter Kashmir Valley - a lush green region that is precisely in contrast to the barren lands of Ladakh. We reach Srinagar in the evening and check into a house boat on famous Dal Lake. After facing many nerve-wrecking challenging, now it time to explore the landscapes of Srinagar and get spoilt in their beauty. Dal Lake, Char Chinar Chinar, Nishat Bagh-'The Garden of pleasure', Chashme Shahi and Shalimar Bagh (garden), are some prominent places where you will be visiting. Early morning, you will be transferred to Srinagar Airport to board a flight to Delhi.